Stephen gave me a couple of necklaces amongst other things--well I chose them and he paid for them--isn't that how it is done. I wanted the pearl one to wear when we went out for dinner--it looked lovely with my new top-and the black one was an after thought because it was half price and a girl can't resist a bargain. 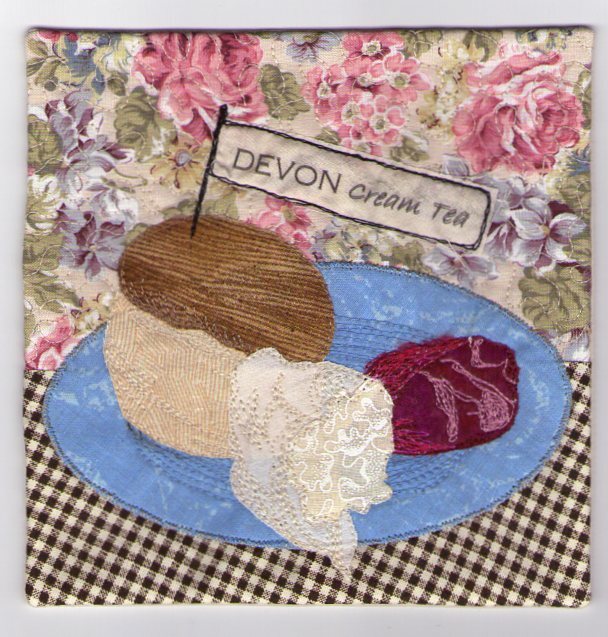 This is the quiltie that Val made for me--she lives in Devon and the quilt represents a Devonshire tea--scones-jam and cream on a gingham tablecloth. The size of it is 15cm x 15cm. I must admit I like the black one best - very classy! So pleased you had a great Day. Val's quiltie for you is great fun and your necklaces are lovely. Probably safer to choose them yourself?! Lovely necklaces. Yes, that is how it's done. My DH wouldn't have any idea of what to buy. Ebony and Justine grew up when we weren't looking. Lovely quiltie from Val. 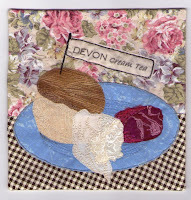 I could just fancy a cream tea.